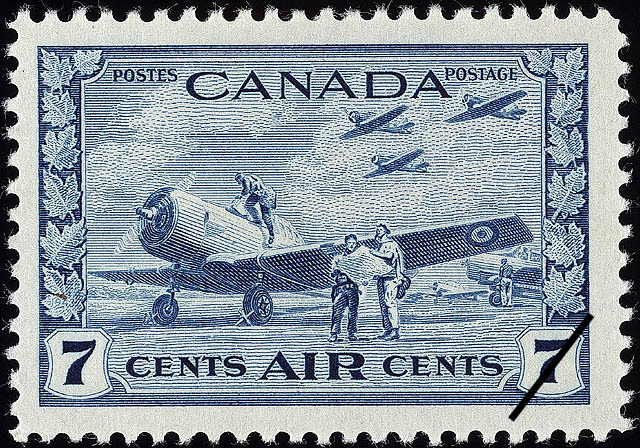 The value of a Air - 7 cents 1943 stamp depends on several factors such as quality and wear, supply and demand, rarity, finish and more. Values in the section are based on the market, trends, auctions and recognized books, publications and catalogs. This section also includes information on errors and varieties and characteristics. Pilot, training under the British Commonwealth Air Training Plan in Canada, entering the cockpit of a training plane. Under this plan, administered by the RCAF in Canada, men from all parts of the British Commonwealth and her allies were trained in schools established across the country. Early in the war an announcement stated that Canada would be called upon to provide trained men for overseas service. Facilities were rapidly expanded to provide training. Agreement of the four Governments concerned, on the principle of the British Commonwealth Air Training Plan, was announced on October 10, 1939, and by early November, representatives of the United Kingdom, Australia, and New Zealand had arrived in Ottawa to work out details of the plan with the Canadian government. A joint agreement for the large-scale training of air crew was signed on December 17, 1939. Under this agreement the Commonwealth partners were to share pro rata in the training program.